On February 19th at the Toronto Region Board of Trade, DIAC co-hosted a panel of visionary design leaders who explained why now is the perfect time for Toronto to invest in design. Toronto is in the midst of a building boom and the City’s expertly trained designers can bring their creativity and problem solving skills to a wide range of current and planned opportunities, from infrastructure projects, to the adaptive reuse of aging buildings, to the revitalization of dormant public space in our ravines, laneways and transportation corridors. DIAC partnered with the Toronto Region Board of Trade to organize and program this event. The panel was moderated by Alex Bozikovic, Architecture Critic of the Globe & Mail. The panel featured Michael Emory, CEO & President, Allied Properties REIT; Ken Greenberg, Urban Designer and Principal of Greenberg Consultants; Alana Altman, Designer, Curator and Executive Director of the Pavilion Project; and Shelagh McCartney, Assistant Professor and Director of + city lab at Ryerson University. City-Building by Design head table. 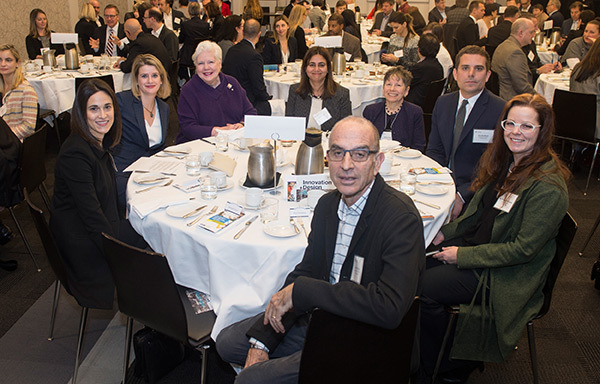 Photo courtesy of Toronto Region Board of Trade. In his introduction to Allied Properties REIT, Michael Emory explained that his company specializes in adaptive re-use of light industrial buildings in major urban environments across Canada. In Toronto, Allied has a number of landmark projects in the downtown core including the Queen-Richmond Centre West which integrates two historic warehouse buildings with a new office tower mounted above them. In Allied’s portfolio of aging building stock, Emory explained, tenants “respond to design and the physical attributes of the buildings they occupy”. These older buildings with their high ceilings, abundance of daylight, hardwood floors, and human-centred space contribute to productivity and an overall sense of well-being. This leads to a value proposition where tenants are attracted by lower rents and employees are engaged by and benefit from an environment that nurtures creativity and comfort. So, observed Emory, “In my industry design does pay”. Ken Greenberg talked about the Bentway, the plan to create a new linear park underneath the Gardiner Expressway that would link the surrounding neighbourhoods with new cultural programming and a trail for pedestrians and cyclists. Sheila McCartney pointed out that design excellence has a role to play, not only in commercial buildings and public space but also in infrastructure. And with new spending on infrastructure projects, this is a good time to add value through design. Toronto has a sound precedent for focusing on iconic design in this category, with the Bloor Viaduct (1918) and R.C. Harris Water Treatment Plant (1941). In recent infrastructure construction, McCartney sited the new Spring Street Salt Shed in New York City as an example of an award-winning structure that is both functional and an architectural triumph. Alana Altman made a strong case for pushing the limits of architecture in temporary structures that drive innovation and test the potential for future buildings. We need to dream big with a bold vision for the future built environment, then back off those ideas a little to capture the inspiration in what we build today. That’s the idea behind the Pavilion Project, an annual competition launching in 2018 and led by Altman that will select an emerging designer to erect a temporary structure in one of Toronto’s developing neighbourhoods. In all, this was a passionate and informed discussion that our host at the Board of Trade panel luncheon remarked could have gone on well into the afternoon. And what were some of the key takeaways? Our ability to create and maintain engaging real estate for diverse investment depends on the quality of our public space. Our public space is the common ground where we get to know each other. (Ken Greenberg).